The world’s oldest department store, Bennetts, has been bought out of administration. New campaign from Uni-ball gives students tools to improve wellbeing through creativity. Judges announce finalists in five brand new awards categories for retailers. Stone Marketing has been appointed authorised distributor for Moleskine. Judges pick their finalists ahead of Awards ceremony at Stationery Show London. Peter Jesper seeks buyer for Harrogate store following retirement announcement. 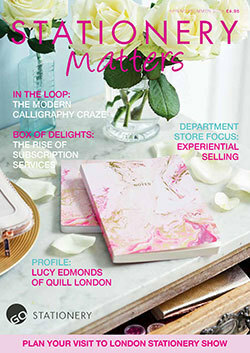 High street retailer Paperchase announces its sponsorship of NSW 2019. Leuchtturm1917 wins Red Dot Design Award for 100 Years of Bauhaus centenary edition. Entry open for the 2019 Innovation Excellence Awards until 5 April deadline. Smiggle moves focus away from UK to ramp up expansion plans in Europe and Asia. Interview: We talk to Emily Sayer, founder of purposeful children’s stationery brand Stib.